How did you make bagoong butter? Did you just mix butter and bagoong? Or did u have to mix and cook? LOL @ double drool...that's hilarious. But yea, I feel you on this corn - it's looking mighty good! Very interesting, I love how I learn something new everyday-bagoong butter. Can't get enough corn and this looks awesome. What a great idea! I never thought to use bagoong to season butter. I just might have to try that and alamang butter - lol! bago'ong-butter! Awesome. Whatever inspired you to create this? Aww...I miss Canada Day. We used to have a bog ol' BBQ and then head down to Prince's Island in Calgary for the festival. You make me all homesick! 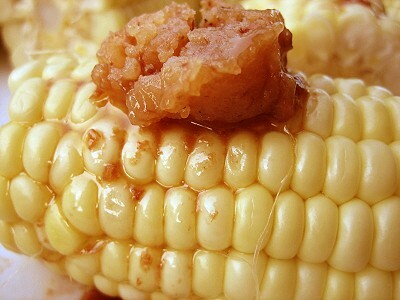 I'd only just heard of bagoong from your prior post...sounds like an interesting combo with the corn! I haven't had the time to catch everybody recently, I have really missed some good stuff! Everything looks so good, I AM drooling just as you said! Even a DOUBLE drool! I don't think I've ever had Bagoong....need to get me some of that. This is really interesting. The stuff I have is probably too strong for this kind of use -- it's Thai. Need to pick me up a proper jar of the Filipino stuff. I think I would just mix together bagoong and softened butter together next time. This one was leftover bagoong butter sauce from our halibut dish. You should just have a July 1 event yourself! I guess the 4th overshadows everything. Hmm, I wonder if maybelle will eat bagoong?!? I would be impressed. 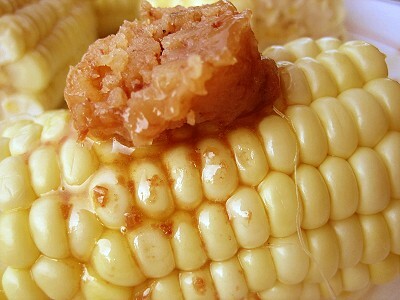 how interesting.... imaging this would be very savory contrast to the sweetness of the corn. We recently discovered cuban/mexican style w/ mayo, cotija cheese and cayenne and lime. delicious! Oh yeah, I've been seeing those Mexican-style corn on the cob too, but have yet to try it. We should soon, when it's corn season.